I have co-chaired the All-Party Parliamentary Group on Global Health (APPG) since its foundation in 2011 with, in succession, Alun Michael MP, Meg Hillier MP and now Dan Poulter MP. It was established to provide a forum within Parliament for the discussion of global health issues, to link Parliamentarians with people working on global health and to influence Parliamentary and Government decision making. It works by holding events in Parliament on issues as diverse as medical research, global surgery and Ebola and about once a year researches and publishes a major report. Five of the 6 reports produced so far are described below with the 6th The triple impact of Nursing described in the section on nursing. 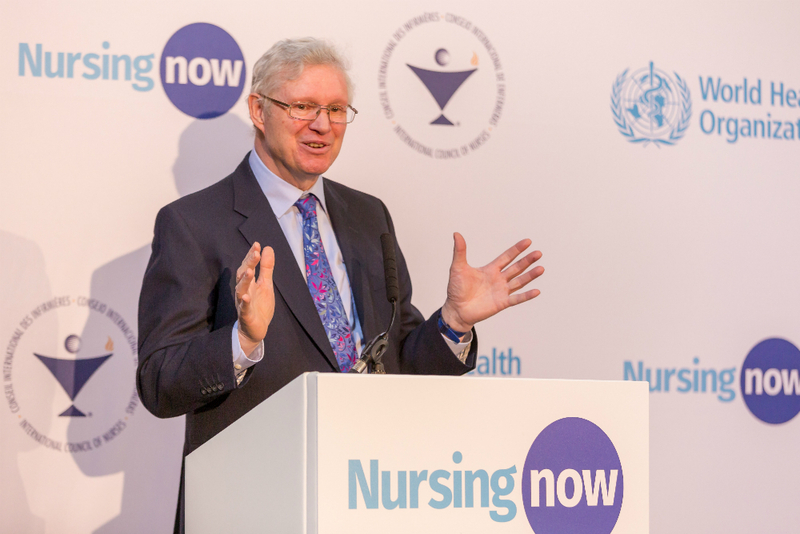 These reports have become increasingly influential with that last two The UK’s contribution to Health Globally and the Triple Impact of Nursing having a wide impact and being extensively cited. 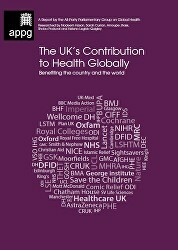 This major report describes the UK’s footprint on health globally across four sectors: academia, government, commerce and not-for-profit. It shows that the UK plays a leading role in each sector: its global contribution second only to the US, which it surpasses in some areas. The report was written by researchers from The London School of Hygiene and Tropical Medicine with support from APPG members and health and scientific leaders. It has been widely discussed with Ministers, in Parliament and externally and provides an authoritative source of reference on UK activities. It concludes that there is scope for the UK to build even further on this leading role globally in science, related commerce and soft power. Equally, without support, this very powerful role could be eroded. It findings produced in 2015 have even greater relevance today following the EU referendum. 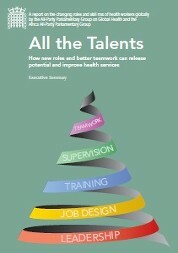 All the Talents (2012) was the first APPG report and provides a global overview of skill mix change (sometimes called task-shifting or task-sharing) reviewing examples from richer and poorer countries. It identifies the key success factors which determine whether or not a change delivers the desired result. It also argues that new roles and better teamwork are needed to deliver better health and health care to the millions who don’t receive it now. 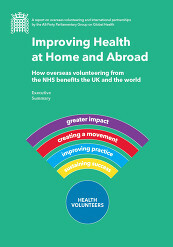 Improving Health at Home and Abroad (2013) is the report of the APPG review of overseas health volunteering from the UK. It addresses the role of NHS staff who volunteer overseas in making improvements in low and middle income countries and advancing health globally. It also describes how the volunteers are able to bring new knowledge, skills and ideas back to the UK. The report points to the potential increase in benefits that will arise both for the UK and for partner countries from improving the scale and quality of volunteering programmes. It argues for three key actions to accelerate growth in developing mutually beneficial, effective global partnerships. The report builds on some of the thinking in my 2007 report Global Health Partnerships. 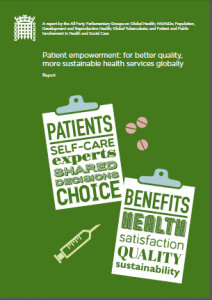 Patient Empowerment for better quality, more sustainable health services globally (2014) was produced by a partnership of six All-Party Parliamentary Groups and takes a global perspective on how to empower patients to play a more active role in their care. The report draws lessons from over 100 innovative case studies submitted to the review, it outlines how much the UK has to learn from high, middle and low income countries – and how these lessons should be applied. At the same time, the report also highlights the UK’s strengths, its important role historically in supporting the global patient empowerment agenda, and how it can continue to play a leading role internationally. 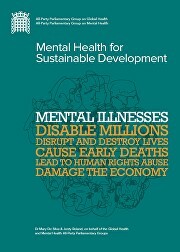 Mental Health for Sustainable Development (2014) was produced in collaboration with the APPG on Mental Health. It considers what the UK is currently doing to improve mental health globally and whether UK expertise and resources could be used more effectively to meet this challenge. The simple message of this report is that progress in development will not be made without improvements in mental health. Mental illnesses cause more disability than any other health condition; bring enormous pain and suffering to individuals and their families and communities; and can lead to early death, human rights abuses and damage to the economy. Improving mental health is therefore a vital part of a successful development programme.